Certainly looks like it. 🙂 Thanks for your comment, Face! You’ll have to keep your eye on this Robert.. will it fall completely do you think? I think so, unfortunately. If not through time, then probably from other people. Inside the first room it looks like someone attempted to light it on fire (and failed) as it looked fairly recent. Quite a shame . More drama from Robert 🙂 What kind of neighborhood do you live in?!? This is great! The whole look with the sky and dry grasses is amazing. I have to wonder what our fascination is with old houses and barns…they draw me in too. Thanks Angeline! For me, places like this are interesting because aside from looking great, they’re disconnected. The world we live in is always ‘on’. Roads leading right to the driveway, electricity powering the whole house, people blogging their thoughts, knowing where everything is via Google Earth & GPS. It’s refreshing to run into spots like these, left abandoned, just waiting for you to document their existence in their current state. It also becomes more of a psychological curiosity also, wondering who lived here before, why they left it, etc. This is an amazing shot. I just love the drama created in this shot. Its brilliant. Thank you Miltonjohns! You have quite a nice blog, great photos! First thing that came into my head….you certainly are on a roll with images perfect for movie stills! Indeed, half of the place inside is already caved in. Only a matter of time, unfortunately. Gracias, Manoli! Son increíbles de cómo las malas hierbas sólo continuará creciendo, con el tiempo tomando el lugar de nuevo! I too wonder at their stories … great photo. 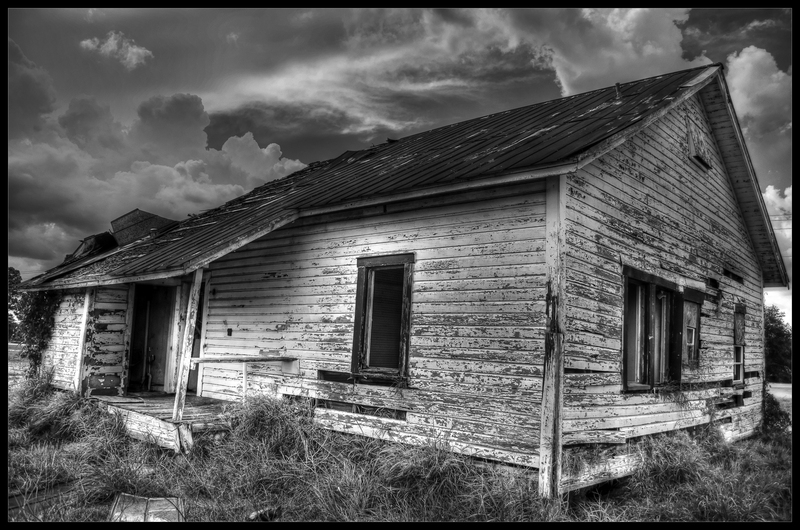 Nice black & white with desolate building and an angry clouds. Great contrast, sharp exposure and great subject. Two thumbs up. Thanks mhdriver! Your “Super Moon” post was great, AZ is beautiful! My pleasure, and thank you for visiting also! Stunning. I stopped breathing for a moment. Thank you for liking my post, btw. robert is all about beauty in the decay, check it out. verrry nice. Diggin’ your style! Thanks for stopping by my visual musings (both times)!!! My pleasure, you have a great blog! And thank you for your visit also! Hey Robert, thanks very much for following my blog 🙂 I just love this incredible photo – the drama! And the delicacy – almost luminous – of the light tones. Nicely done.